The Champion’s League is back for another year of competition between the top teams of Europe. In this guide I’ll be showing you how you can watch the entire Champions League 2018/19 competition free from any country in the world. You’ll be pleased to know it doesn’t include any sketchy streams and you won’t need a cable subscription either. After Real Madrid brushed aside Liverpool in the final last year it is anyone’s guess who’ll be taking part in the final again this year. With teams like Real Madrid, Barcelona, Liverpool, Man City, Spurs, PSG, Juventus, Inter Milan and more taking part it’s set to be a tough competition. So read on to find out how you can watch the Champions League 2018/19 including all the finals live online for free from anywhere. To watch the Champions League you’ll need to get yourself a VPN service. This comes as an app you download for your device that lets you access the official streams from overseas. 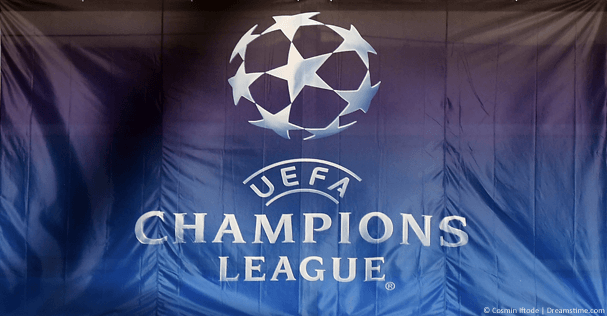 In India the Champions League is shown completely for free by broadcaster SonyLiv. A VPN allows you to pretend you’re in India which bypasses the geo-restrictions allowing you to watch anywhere in the world. If you’re confused, don’t worry. All you need to do is select one of the three providers and sign up. A VPN service will cost you a couple of pounds or dollars per month but if you want to watch the entire Champions League 2018/19 tournament it’s worth signing up for a year. ExpressVPN have an annual package deal that’s 49% cheaper than paying monthly. If you still don’t know who to choose, pick ExpressVPN and sign up, I found them to work the best. Once you’ve signed up follow the instructions below. Now you’ve got a VPN service you need to download their app for your device and connect to India. It’s this that will allow you to watch the Champions League in any country. Follow the steps below to get started. If you’ve already signed up for a VPN service then skip step 1. Visit the ExpressVPN website and sign up for their service. Consider their yearly plan if you want to watch the entire tournament because it’s 49% cheaper than paying monthly. Once signed up download the correct app from their ‘Products’ area for your device. Open the app and login or activate it when requested. Then press All (2), Asia Pacific (3) and finally click India (4). Press Connect if the app doesn’t automatically connect for you. Once the app has connected visit the SonyLiv Champions League page. Watch the Champions League with ExpressVPN. 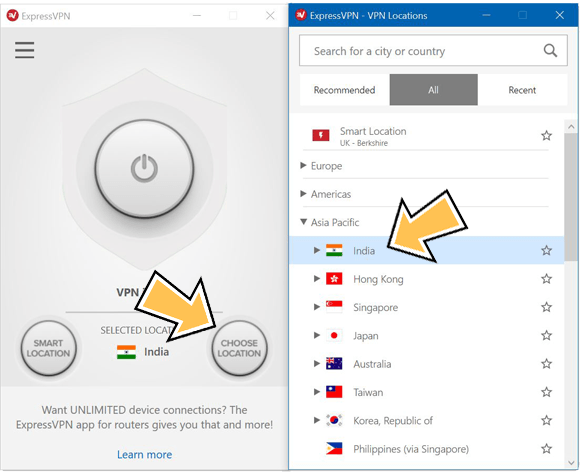 Now you’re connected to the ExpressVPN app any websites you visit will think you’re in India. You’re now free to watch all the Champions League games live on SonyLiv in any country in the world. You don’t need to pay any subscription charges. When you finish watching a match simply disconnect from the app. You can reconnect in the future when you want to watch another match. Can I watch on my mobile or tablet? It’s easiest to watch on a regular computer or laptop but it is possible to watch on a mobile or tablet too. For this you’ll need to do something known as ‘sideloading’. You won’t be able to directly download the SonyLiv app from your app store because you’re not in India. For Android devices, you can download the SonyLiv app from APK Pure. For Apple iOS devices like the iPhone and iPad you’ll need to follow this guide on how to install apps outside their intended country. When is the Champions League 2018/19 shown? The Champions League 2018/19 will kick off on the 18th and 19th September 2018 with the group stages. The group stages will run until 11th and 12th December where the tournament will progress to the Round of 16. The Round of 16 first legs will be played between 12th – 13th and 19th – 20th February 2019 with the second legs played on 5th – 6th and 12th – 13th March 2019. The Quarter Finals will be played between 9th – 10th April with the return leg on 16th – 17th April. The Semi-Final will be played between 30th April – 1st May and 7th – 8th May 2019. The Final will take place on 1st June 2019 at the Wanda Metropolitano, Madrid, Spain. If you want to watch the Champions League 2018/19 matches but you don’t have cable and you can’t pay for a service that shows it then you need a VPN. A VPN allows you to watch official overseas streams of every match of the Champions League. I recommend using ExpressVPN. After extensive testing I found them to be the most reliable. For you they also have a 30-day money back guarantee so if you can’t get it working or you’re just not happy for any other reason, simply get your money back. You can get ExpressVPN by clicking the button below, sign up for their service and download their app. Then connect to India and then you can watch all the matches live on SonyLiv in any country online. Who do you think will win this year’s tournament? I’m hoping Liverpool can repay Real Madrid for last years defeat but I would love to hear your thoughts. Why not let me know in the comments section below?